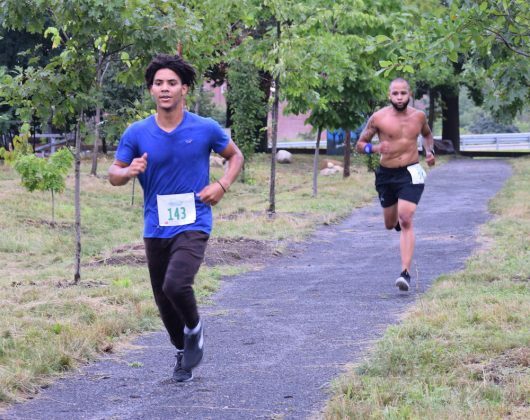 Across the country, members of Groundwork communities are advancing health and equity by transforming brownfields and neglected spaces—one park, playground, and trail at a time. How do they do it? Our recently completed Green Space Actions Evaluation Project was designed to gather preliminary evidence of how Groundwork’s collaborative, community-led green space improvement model—what we call our “green space action” work—can advance equitable health outcomes in the communities in which we work. Why Evaluate Our Green Space Actions? Over the years, many of us who’ve been taken part in Groundwork’s community-centered green space projects noticed something happening in our communities as a result of the work—something beyond the very visible “changing places” and “changing lives” that our tagline asserts. While these changes weren’t always apparent to outside observers, we felt certain they were tangible to the people intimately involved in our green space action projects through building relationships and connections, sharing leadership of a broad agenda, and doing the work together, in community. The act of collaboratively transforming neglected and underutilized properties and brownfields—vacant, abandoned, and/or contaminated properties—into high-quality green spaces provides an opportunity for a community to practice cross-sector leadership while investing in local stakeholders to strengthen a community’s sense of ownership, promote community healing, build wealth and wellness, and understand how this work contributes to the social determinants of health. Gather the first-hand stories Groundwork communities’ green space action experiences to help amplify the voices of the communities we work with and breathe life into the data we were collecting. In the summer of 2018, five Groundwork Trusts (in Richmond, Virginia; Richmond, California; Rhode Island; Yonkers, New York; and Lawrence, Massachusetts) piloted several evaluation tools designed to test elements of Groundwork USA’s new Theory of Change. Our goal was to build a set of participatory methods for ongoing evaluation of Groundwork green space actions and get feedback from the participating Trusts on the evaluation tools developed. Our evaluation found preliminary evidence that Groundwork Trusts are creating near-term impacts and helping to improve community health and equity. Groundwork green space actions are assuring more equitable access to green spaces. From a survey of 121 members of Groundwork communities participating in the evaluation, we learned that the average walk time from home to a Groundwork green space action was 12.8 minutes. We see this data as an important and validating benchmark for our green space actions work, as widely accepted research shows that living within a 10-minute walking distance of a quality park or green space is good practice. Research also asserts what low-income communities and communities of color have long known first-hand: that access to green space is inequitably distributed across urban populations. These are issues that Groundwork Trusts and our green space actions actively seek to address. Groundwork green space actions are strengthening social capital. Of the 121 residents surveyed, 75% agreed or strongly agreed that the Groundwork green space action in their community helps them see more members of their community interacting with each other. This finding is important because research shows that the greater the degree of residents’ civic engagement, the stronger they perceive their bonds with their community. In turn, residents who report higher levels of bonding social capitalalso report higher levels of neighborhood collective efficacy—the ability to join together to achieve common goals and preserve shared values for the good of the community. In short, this finding tells us that the work a community does to drive a Groundwork green space action to completion creates important “collaborative infrastructure” from which communities can develop common purpose and advance a shared equity agenda. Groundwork green space actions are creating a new generation of environmental and civic leaders. These sentiments also came through in the comments of youth focus group participants when asked about their growth as leaders and about what or who helped in their career growth and development. Groundwork USA is excited about these findings, as they offer our first bundle of evidence that green space actions are indeed creating near-term impacts that positively influence community health and equity. A challenge we face is that evidence of health equity outcomes takes a long time to see across populations. Since our evaluation timeline lasted just two months, we sought to understand the ways in which Groundwork’s approach creates the antecedents of health equity in the near-term. Given this, we analyzed the evaluation findings with an eye toward identifying those aspects of our green space action work that set the stage for improved health and equity outcomes to unfold among members of a community over time. 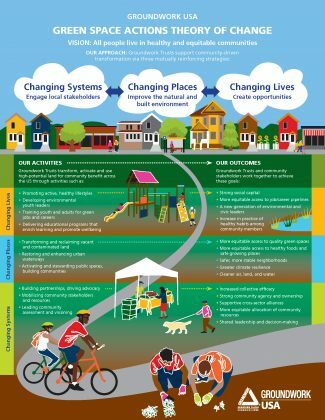 In examining these and other indicators of impact, we feel confident that the early findings of our evaluation offer promise that evidence of more health equity outcomes will emerge in Groundwork communities where green space actions have taken place over a longer period of time—perhaps one or two decades. It’s still too early to tell, and we still have much work to do to continue changing places and lives, and ultimately, changing systems to produce more equitable health outcomes for communities.